2014 Road Trip Photos #21: Fame and Fargo « Midlife Crisis Crossover! General Chuck Yeager was the first man to break the speed of sound. And he’s been to Fargo. Day Five brought us to a state we’d never seen, a town I’d known only from a movie, and some familiar names we didn’t expect to greet us. I-94 West through Minnesota takes you to the twin cities of Moorhead, MN and Fargo, ND, two cities in different states with very different levels of popularity, all thanks to Hollywood. A few miles into North Dakota, a quick stop at their Visitors Center is all it takes to connect with big-name actors and personalities. One or two of them are even from Fargo. 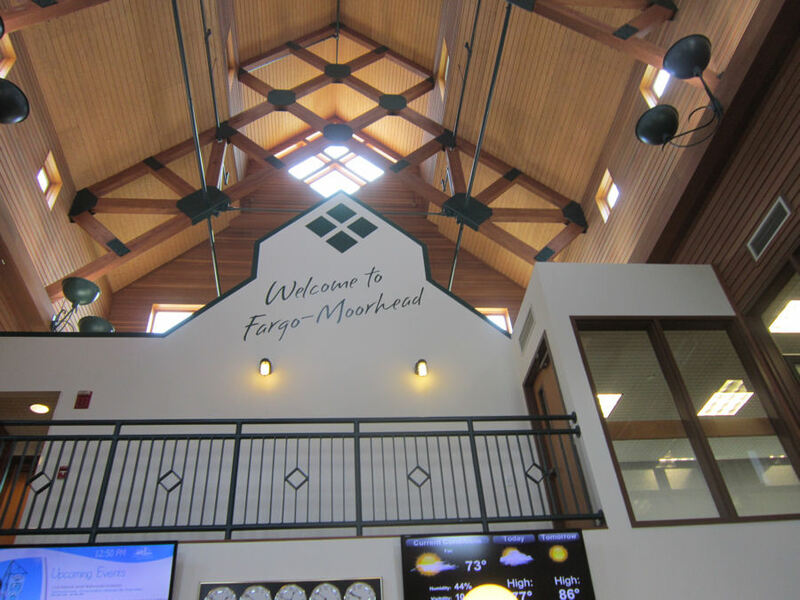 The Fargo-Moorhead Visitors Center is spacious, well-kept, and graciously welcoming to out-of-towners. 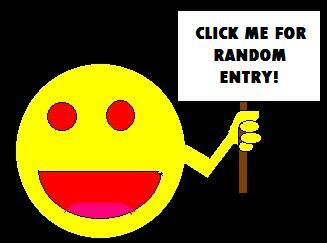 You can browse their modest souvenir selection or hang around outside and see the free stuff on display. Fargo isn’t a large town, but we’ve received much smaller welcomes in much larger cities. Their most well-known claim to fame is the eponymous movie in which the Coen Brothers put them on the map in exchange for a Best Adapted Screenplay Oscar, earned Frances McDormand a Best Actress Oscar, and gave Steve Buscemi an ignominious, grisly farewell. If you’ve seen the movie, you know the significance of the wood chipper. This one’s the centerpiece of their outdoor display, but it’s not the real wood chipper. This is merely a display item better suited to resisting the outdoor elements. 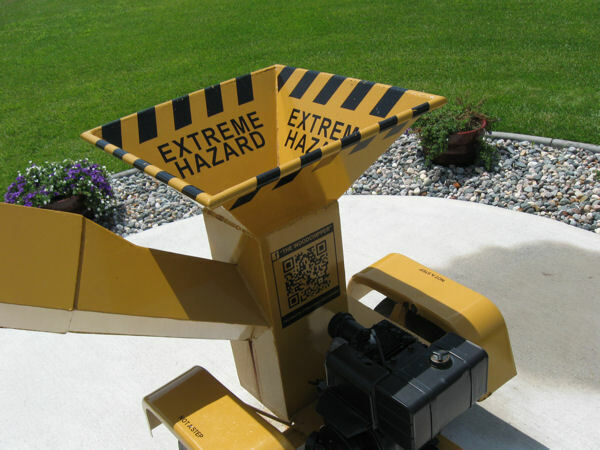 True story: the QR code on its side links to the wood chipper’s official Facebook page. I checked. And yes, Fargo is large enough to carry a 4G signal so I could check. Inside the Visitors Center is the main machine itself, which we previously showed off in a teaser photo for this very entry a while back. 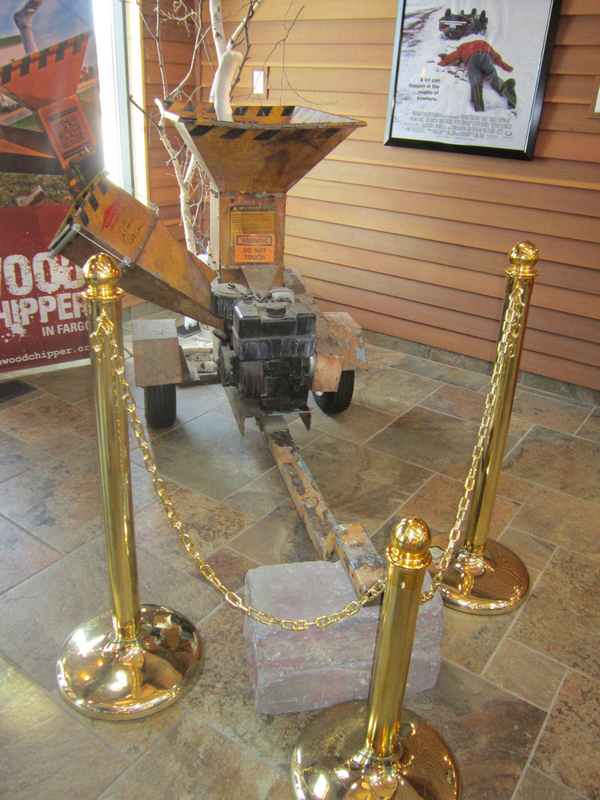 You can tell this is the real wood chipper because of the chains in front of it that imply, “Please Do Not Touch Memorabilia: Honor System Will Be Enforced”. 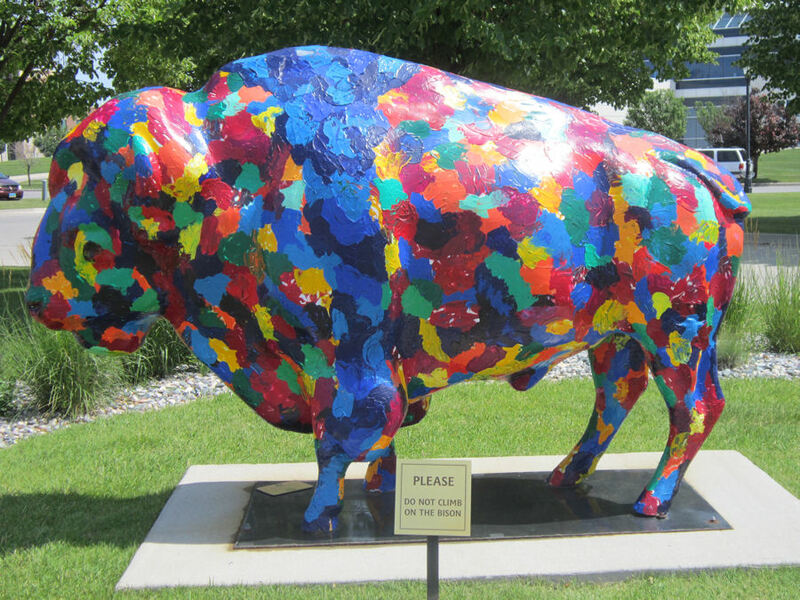 If you need a break from Hollywood, this patchwork bison was one of several statues created as part of an art project called “Herd About the Prairie: a Visual Stampede“. This one is named Quilty, probably. 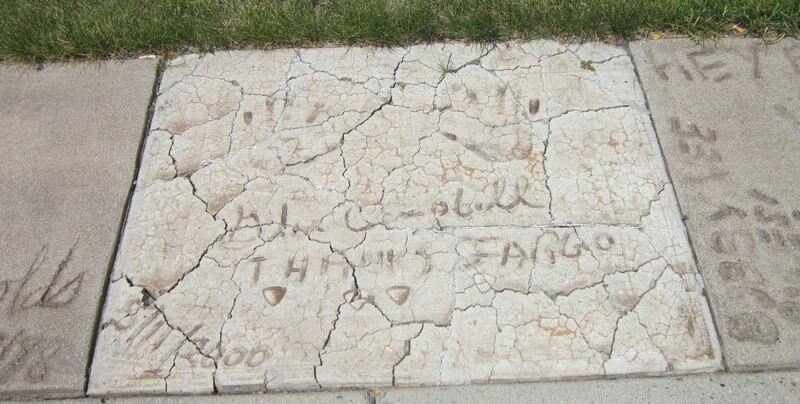 Their largest display is Fargo’s Celebrity Walk of Fame, a collection begun in 1989 by local printer Mike Stevens, who would approach celebrities whenever they came to town and ask for their contributions. 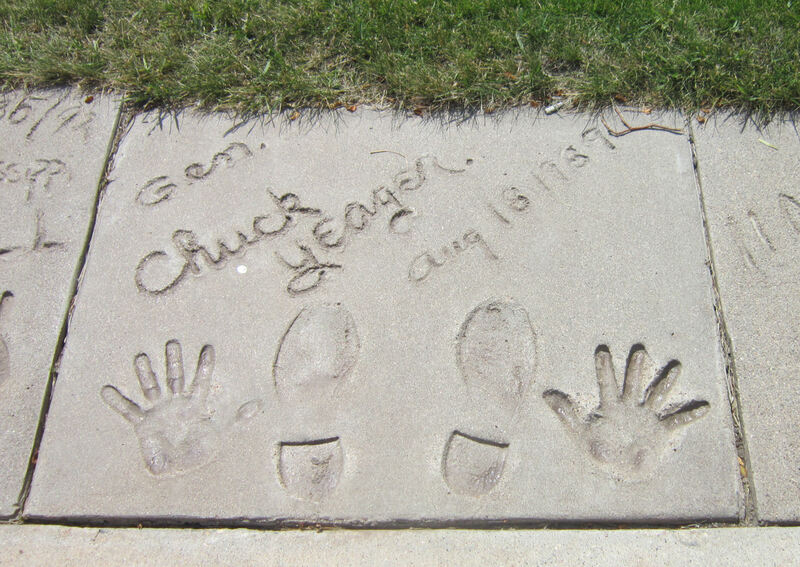 The Visitors Center has over one hundred sets of limb-prints to their credit, from sports stars to actors to politicians and more. 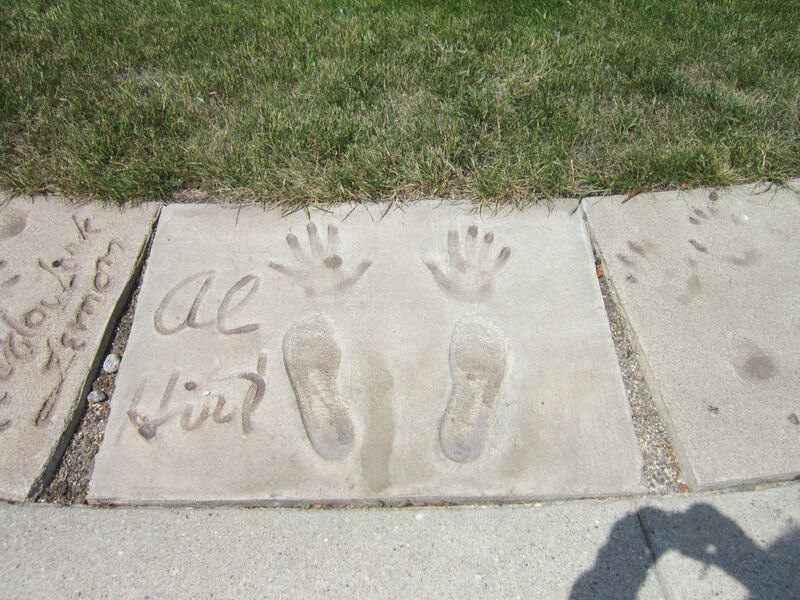 The first to be cemented for posterity was jazz clarinetist Al Hirt. We have a relative who’s a big, big Al Hirt fan. Score! 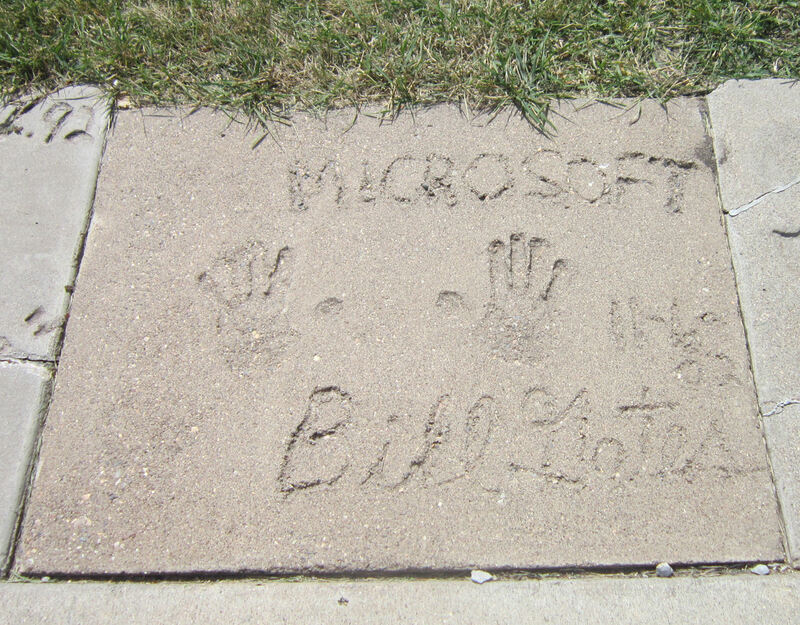 See the hands that created and corrected the first Microsoft bugs! 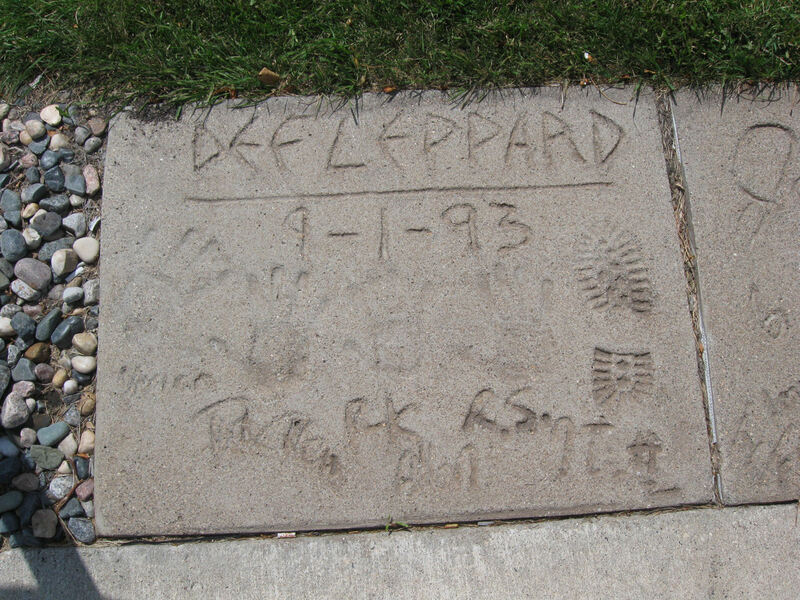 Four hands and one foot from all the guys in Def Leppard. Don’t ask me which one is the drummer’s. HOLY COW, GUYS, IT’S BERT AND ERNIE! 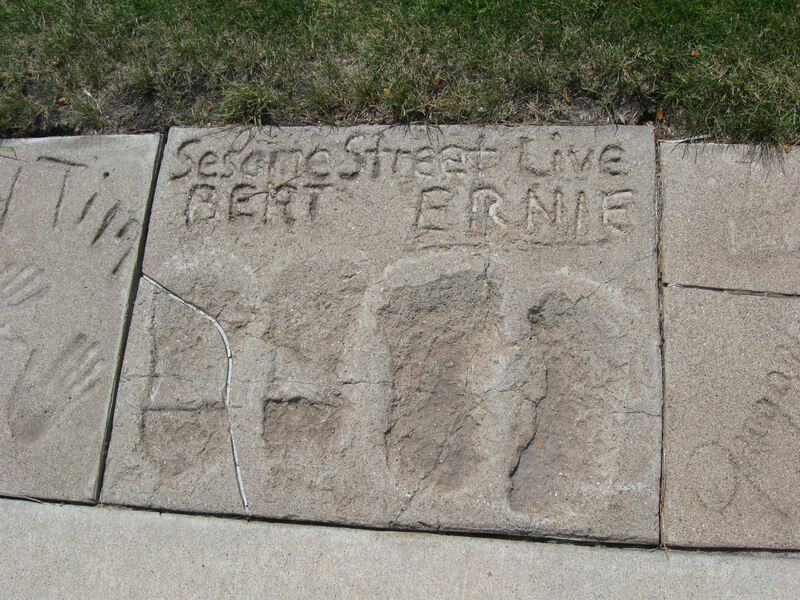 I CAN’T BELIEVE **THE** BERT AND ERNIE CAME TO FARGO AND STOOD IN THIS VERY SPOT! C IS FOR CONCRETE, AND CONCRETE IS FOR ME! This didn’t mean as much last July, but knowing what we know now, seeing the square of Academy Award Nominee Glen Campbell in such shambles is heartbreaking. You’ll note in that last photo, at far right is the signature of singer Bobby Vee, who stands out from the crowd because he was actually born in Fargo. Meanwhile, Bill Gates sneaks in as a wannabe poser who only wishes he were from someplace as nifty as Fargo. Three hours north and across the border and you could have come for a visit.